Set amidst the beauty of the St. George, Utah area, owned and operated by Vanguard Golf Management, this golf course is pristine and you will be treated like a member of a private golf club. Designed by course architect Keith Foster, Coral Canyon provides a rare opportunity for you to enjoy luxurious golf at the doorway to some of the world’s most famed natural wonders. Coral Canyon was designed to fit seamlessly into its beautiful natural environment. The course works its way around some of the area’s natural land formations that give the course a sense of personality. Players have the opportunity to experience pure golf in the pristine native Utah desert. The Coral Canyon Golf Course, just off of I-15 in Hurricane Utah at Exit 16, is one of the best courses in all of Utah golf. 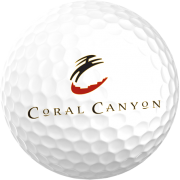 Coral Canyon possesses many qualities that make it a truly great golf course for players of all levels. The golf course has a striking presence that you notice from the freeway with the great contrast of green grasses against the red rock. The fairways at Coral Canyon are generously wide and the greens are designed to allow you to run the ball up to the green or fly it all the way to the pin. Perhaps the quality that separates this course from many others is the great rhythm of the design. The golf course plays like a symphony with a flow and a mix that piques your interest and enhances your enjoyment. The best compliment that golfers usually bestow upon the Coral Canyon Golf Course is that it is fun, a term used too rarely to describe modern golf.